Can you explain this? I would have thought the ingredients and nutritional values are the responsibility of the company(and the relevant government authorities) not the Kashrus org? 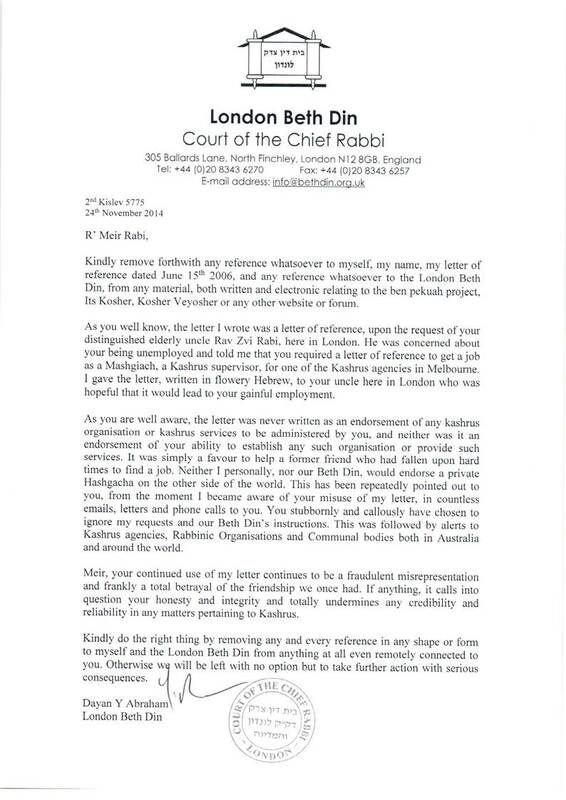 But even if it was watered down or some other such contravention, it has nothing to do with the Vaad HaKashrus. Do you really thing the OU gets involved with such things? The only thing they worry about is Kashrus. The OU doesn’t but the Badatz definitely do!!! Same with Belz. The only difference was the amount of water. I kid you not, sadly. But what would Bdatz (or Belz) gain by adding water? They don’t own the company? Re the bdatz diluting and especially to make a profit, this is a very serious allegation. You haven’t brought any evidence at all that this is the case. I’ve done searches of the net, but have not seen anything of this. If it’s not true or even if not accurate, it is be Motzie shem ra. As for the other stuff there was a program on Israel TV as I understand it. Am I wrong assuming that there is (or was) a Clal BATEL BESHISHIM? Isn’t it that if a Jew does it on purpose = LEKATHILA it is not BATEL for him – אצל יהודי ישנו איסור של ביטול איסור לכתחילה but is batel for others, unless it is manufactured in a Jewish factory which produces for the general public? With a gentile doing it, it is Batel. The Mashgiach is usually not the manufacturer, and it isn’t him doing it. “ההוראה ברבנות הראשית היא לא לבטל איסור מלכתחילה, ולכן לא מסתמכים על “בטל בששים”. Now you see that the poor fellow who cannot consume lactose in the milk cannot eat it with meat dishes as it is Milchig. He cannot consume it with Milchig, as he is allergic to Lactose. As I said, it is a foreign product not manufactured by Jews. Now I wonder – Can one use on Pesach pans or pots that were Hometz, and Kashered for Pesach in boiling water? Here there is not enough Batel Beshishim, here we need LO YIMATZE KOL S’OR. I am sure that the factory in CHUTZ LA’ARETZ cleaned their manufacturing utensils very well to be able to state “LACTOSE FREE”, which is a USHMARTEM M’OD L’NAFSHOTECHEM. I want to point out that I am not a Posek, just an observer. You write: “The only thing they worry about is Kashrus.” I do not know about OU, but am wondering in general. Is the Rabinate’s concern only about Kashrus or Halacha? We just read this week (KI TISA) :אלה א-לוהיך ישראל Is this the face of the Rabbinate? Were our sages wrong saying עשה לך רב? Should they have said קנה לך רב? Do they worry ONLY about Kashrus? Can a Mashgiach recommend to substitute a Kosher ingredient in the product, for one from which he gets a kick-back? מסעדנית מטבריה שנוהגת לשטוף היטב את הירקות ולהכשירם, ברבנות לא התרשמו מכך וחייבו אותה לקנות ירקות מהדרין אבל ממשווק אחד בלבד, למרות שיש בשוק קרוב ל-20 משווקים של ירקות מהדרין. בירושלים דרשה הרבנות מבעלת המסעדה לקנות רק מארבע חנויות וגם להציג לה קבלות. “הם אמרו שכל המוצרים שלנו, מסבון כלים ונייר טואלט ועד השמן והסוכר צריך לקנות בארבעה מקומות בלבד – שם נגמר הרומן שלי עם הרבנות”, מספרת בעלת מסעדה בבירה. R’ Meir, there is no doubt in my mind that this is a case of small amounts of milk. It may be due to dairy equipment, it may be due to ingredients. The Rabanut don’t pasken especially for someone who has a lactose intolerance. For such a thing, I would suggest going to your Posek who will liaise with the Rabbanut, and advise what the lactose intolerant person can do. We have a company in Australia called Sweet William which makes zero dairy chocolate. Interestingly, one of our secretaries who gets sick from milk couldn’t understand how even “dark dairy free chocolate” made her sick. I told her to ask me, and I will look up items from our Kashrus list and will tell her what is Pareve Lemehadrin. Since she uses these (and there is Soy cheese as well) she said she has been much better off. החכם עיניו בראשו and where there is an ענין of sickness, there is of course room to be Meikel when there are no alternatives. I advise you speak to your Posek, who knows you. No lactose does not mean no milk. It just means no lactose. Many lactose-free products are 100% milchig. Also, cleaning is not kashering. The halacha considers a milchig keli to be milchig until it’s kashered, as if it were made of solid milk, even if it’s been thoroughly cleaned. Kashering makes it parev again. And a hechsher absolutely has the right to insist that ingredients come from a supplier it trusts, not from dozens of fly-by-night “mehadrin” suppliers about whom at best it knows nothing. I was talking about products manufactured in non-Jewish enterprises. The question there is not if the utensils are Milchig, the question I asked: IS IT NOT BATEL BESHISHIM? If a Jew mixes milk and meat LECHATHILA =איסור של ביטול איסור לכתחילה ONLY he himself cannot eat it, but for other Jews is it BATEL BESHISHIM and they may consume it (not in a Jewish factory that distributes its products to the general public). Am I correct? If a manufacturer or eating place uses the prescribed ingredients which he buys from X, isn’t it the duty of the Kashruth giver to check if that product is Kosher? Do you think that dismissing it without reason is the correct way? Restricting one to buy from one supplier eliminates competition and has also other connotations (which I mentioned). Do you think that the NOTEN HECHER can ask the manufacturers to buy toilet paper or salt at his designated establisment as a condition for him granting his Hecher? You write: “about whom at best it knows nothing.” Let him find out. That is why he is there. Don’t you think that one cannot La’Assor products which he has not examined? If he wants to prohibit them, he has at least an obligation to examine them at first and explain why it is not KOSHER. You were lucky suggesting the PARVE chocolate. You can send me some – just joking, I am not allergic to Lactose. If I remember right, we had here a case of someone allergic to Lactose and consumed a local made Parve chocolate and they found out it contained milk. It had the Hecher of being Parve. החכם עיניו בראשו did not help here. Do you have in Australia a Hechsher ללא חשש לינת לילה ? You wrote: Do you have in Australia a Hechsher ללא חשש לינת לילה ? I’m not sure which types of things you are talking about, but if it’s the items which are problematic because of שדים there are plenty of ways to avoid it for those who worry about such things. They do address it though L’Mehadrin. Personally, it is not an area I understand at all as the Rishonim don’t mention it (e.g. onions and the like).